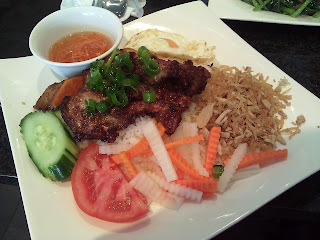 Paid another visit to the Vietnamese restaurant in St Albans that I promised to write about on my last post. We basically ordered the same items, so this review will be fairly brief, maybe. 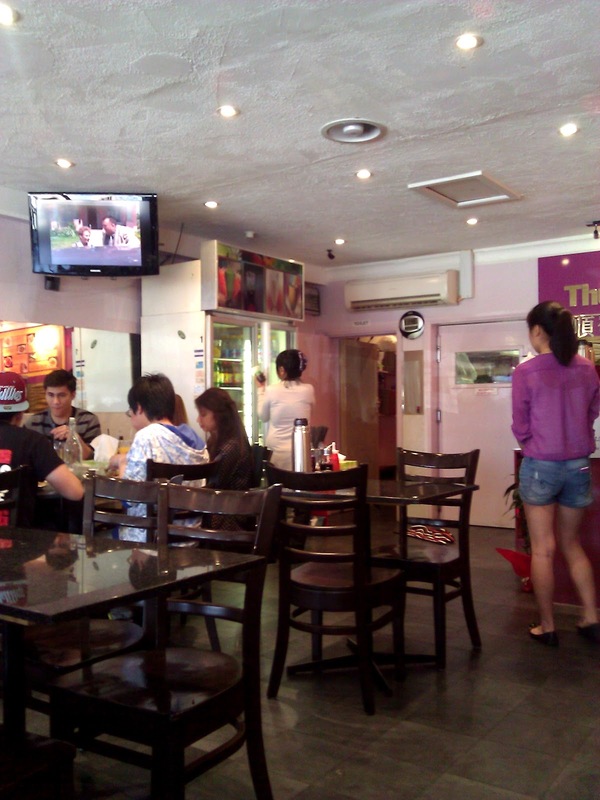 It's directly opposite the popular, and my personal favourite, banh mi store called Fresh Chilli Deli. Thuan Phat seems fairly new, so it took me awhile to work out the exact address. 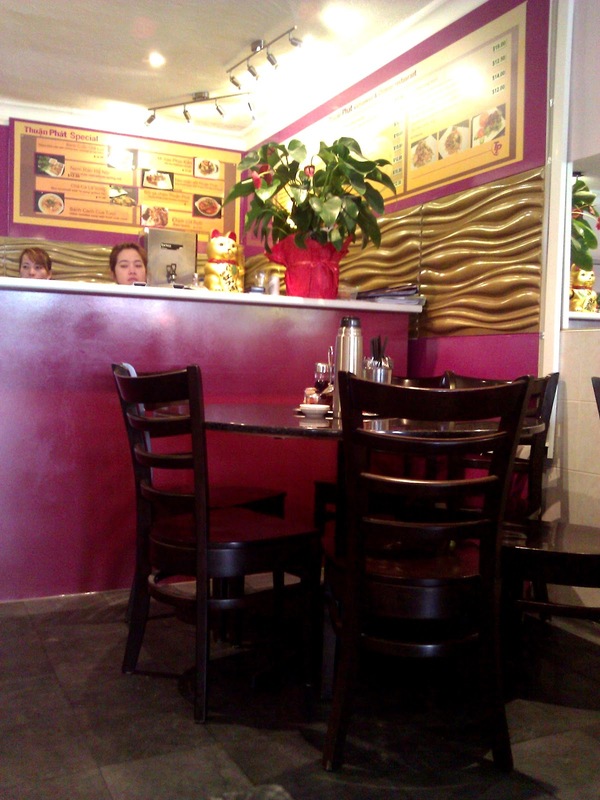 The location seems to have been home to a number of similar Vietnamese & Chinese restaurants - according to Google Maps it was Kim Quynh as of 2010, and Phuong Vi as of 2007. I find these Vietnamese restaurant names quite difficult to pronounce and remember (well, except for ones called Pho, or Saigon something). Website: apart from a rudimentary Facebook page, there doesn't seem to be a trace of this restaurant online! 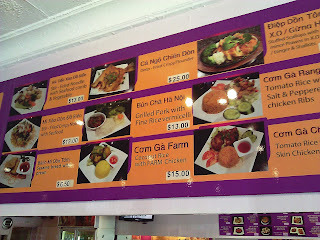 Price: standard ~$10-$15 for rice or noodle dishes. They have the standard range in a long menu booklet, but also a few key dishes features on the wall (see above). 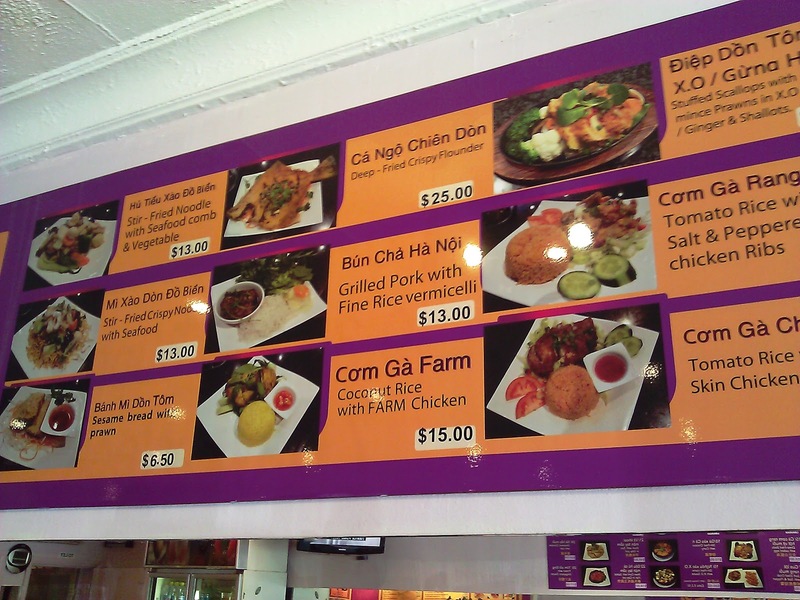 I love large, colourful pictures in menus, especially of dishes with unfamiliar names. Avocado smoothie - $3.50 good value! I think this looked more green in real life. 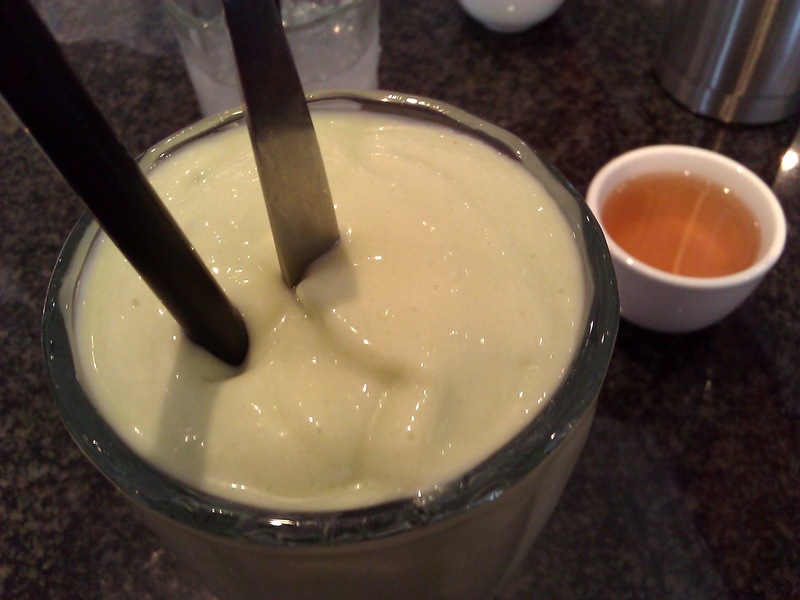 Lovely buttery avocado blended with ice and a sweet milkiness. This drink (also known as sinh to bo) is commonly found in Vietnamese restaurants. Years ago, I thought my high school friends were weird when they talked about how avocado drinks were great - I guess it is a novel idea, if you're used to having avocado with sandwiches and other savoury dishes. Now it's one of my favourite drinks, mmm. Grilled pork chop on broken rice - about $10. I already wrote a little about this dish on my review of Sen (Footscray). The key difference was the better piece of pork chop here, with a larger piece of meat, which was tender rather than hard, and an outer coating which was slightly crisp and full of lemongrass flavour. The shredded pork and pork skin was also tastier. The serving size was also more generous, for the same price. 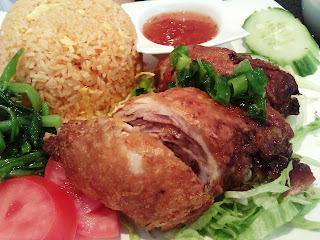 Tomato rice with crispy skin chicken - $10 with also generous servings (difficult to appreciate from this photo). The chicken at Sen and here are similarly delicious and tender, served with the same sweet sticky chilli sauce. Water spinach - $12 stir fried vegetables with garlic. Nicely done, and a huge plate of greens which three of us could barely finish. 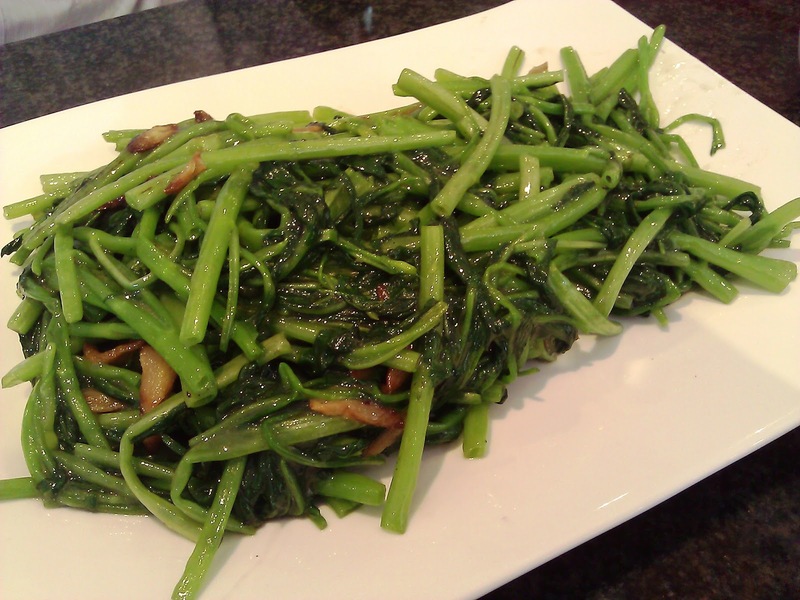 Water spinach has variety of names, including 空心菜 (hollow vegetable) in Chinese, and is also commonly known as kangkong across South East Asia. It's an interesting vegetable - when cooked, the stalks are crispy and hollow tubes, and the leaves soften to a slippery and slightly slimy texture. 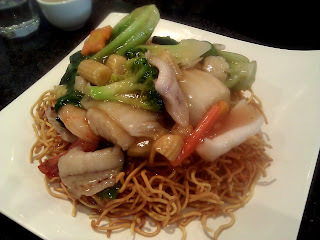 Stir fried crispy noodle with seafood - $12 and slightly cheaper if served with chicken, or other meats. I enjoyed the noodles, they weren't too oily, there was just enough starchy sauce for the top layer to be soft enough to eat, without soaking through to ruin the dry crispiness of the rest of the noodles. It's important, because it's frustrating trying to find enough crispy noodles to crunch on when the sauce is drowning everything, and equally bad when the dish is too dry and tasteless because there isn't enough sauce. Lots of buk choy and vegetables, but only one or two pieces of prawn, scallop, fish and squid. Song Huong across the road scoops on alot more seafood with the same dish, but is also pricier (~$17 from memory). 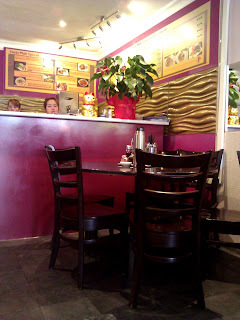 Other: bright magenta purple seems to be the theme of this restaurant! Opposite of Sen, here is your typical TV in the corner, slightly dim lights, clashing colours, with a glittery golden beckoning cat (招き猫 - maneki neko) at the counter. Service was attentive and the complimentary hot tea was actually noticeably nice. Rating: 4.5/5 portions and quality are bigger and better for the same dishes, at the same price found in similar restaurants. Ingredients taste fresh and the flavours are great. So far this is one of our favourite Vietnamese restaurants in the Western suburbs of Melbourne. Considering how many times this place has closed and reopened under different names, I do hope Thuan Phat is still there the next time I visit.